Department of Operations and Management Information Systems, Faculty of Business and Accountancy, University of Malaya, Malaysia. Department of Business Policy and Strategy, Faculty of Business and Accountancy, University of Malaya, Malaysia. Research aims: This paper aims to examine the relationship between Islamic religiosity and preferences towards Islamic tourism products and services. 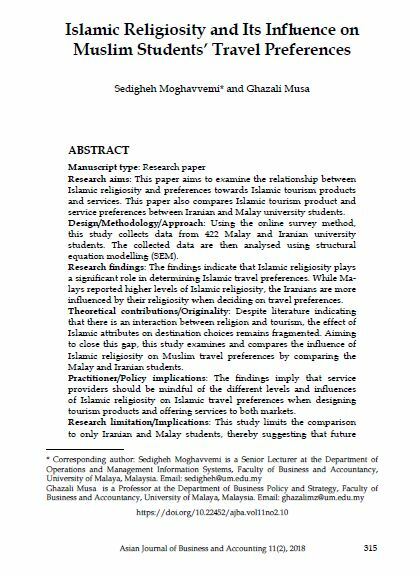 This paper also compares Islamic tourism product and service preferences between Iranian and Malay university students. Design/Methodology/Approach: Using the online survey method, this study collects data from 422 Malay and Iranian university students. The collected data are then analysed using structural equation modelling (SEM). Research findings: The findings indicate that Islamic religiosity plays a significant role in determining Islamic travel preferences. While Malays reported higher levels of Islamic religiosity, the Iranians are more influenced by their religiosity when deciding on travel preferences. Theoretical contributions/Originality: Despite literature indicating that there is an interaction between religion and tourism, the effect of Islamic attributes on destination choices remains fragmented. Aiming to close this gap, this study examines and compares the influence of Islamic religiosity on Muslim travel preferences by comparing the Malay and Iranian students. Practitioner/Policy implications: The findings imply that service providers should be mindful of the different levels and influences of Islamic religiosity on Islamic travel preferences when designing tourism products and offering services to both markets. Research limitation/Implications: This study limits the comparison to only Iranian and Malay students, thereby suggesting that future research could include more diverse samples of Muslim students including those from non-Muslim countries. MOGHAVVEMI, Sedigheh; MUSA, Ghazali. Islamic Religiosity and Its Influence on Muslim Students’ Travel Preferences. AJBA, [S.l. ], v. 11, n. 2, p. 315-340, dec. 2018. ISSN 2180-3137. Available at: <https://ajba.um.edu.my/article/view/15299>. Date accessed: 25 apr. 2019. doi: https://doi.org/10.22452/ajba.vol11no2.10.